I'm in the process off moving my blog to headerphile.com. I will update and improve each post in order to make then easier to read. I hope you will like my new blog. Let's take a look at the different type of iterators. The properties of the various iterators here are the bare minimum of the "pure" version of the iterators. Some implementations might support more operations. Note that forward iterator, bidirectional iterator and random access iterator does not implement output iterators. This means that they can't, by definition, write to the object they refer to. We'll get back to this later. 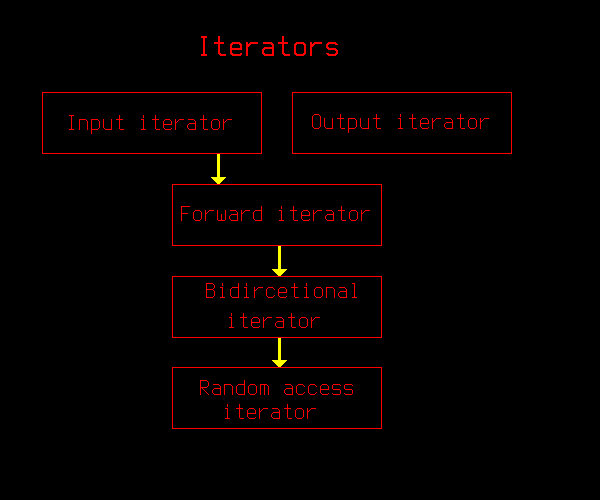 Let's start by looking at the first type of iterator, output iterator. You can't go back with an output iterator, and you can't iterate over the same range twice. And there is no guarantee that you can write to the same position twice without incrementing the operator. And you can't compare two output iteratrs either. What you're basically doing is writing into a "black hole"; you're just writing and you can't see what you have written. Most iterators, though implement output iterators but also has other traits that enables more functionality. We'll look at these later. cout is of the type ostream. You also have an iterator to this type, called ostream_iterator that can be set to an ostream Writing to this iterator writes to the ostream it's an iterator to. The ostream_iterators are output iterators. Using cout like this shows how output iterators works ; you can only write and the writing has to be sequential. You can newer go back. Once you've written something, you can't "go back" and write something in the position before what you just wrote. Since we've specified int as the template argument of the input_iterator, the input_iterator ( intReader ) will become the same as invalid, which in C++ means the iterator will point to the element past the end element. This is the same as readerEnd and the loop will terminate. Here we've effectively moved back and continued moving forward, which again would not be possible with code>output iterators or input iterators. A linked list is a container that works a bit different from the array-like containers. Basically, each element has a pointer to the next element and previous. So that all the elements are chained together using pointers. If you want to go from one element to another, you use the next pointer ( or the previous if you want to go back ) This can mean a lot of operations if the list is very large. A container in like this didn't exist in C++ until C++11 which has the container forward list. The bidirectional iterator is very similar to forward iterator. The only different is that it also supports backwards iteration. And that's all the difference between code>forward iterator and bidirectional iterator. As you can see, bidirectional iterators can iterate back and forth without problems. Now let's look at the final iterator, bidirectional iterator. Array like containers are all containers that are organized as a continuous piece of memory. This means you can predict where the next item is, since it the next item will always be the previous item + the size of each item. Using this knowledge, it's easy to jump forward or backwards. An example of these containers is vector, which I covered in a previous part. The above example shows how any array-like container ( vector, array, queue, deque, ... ) is laid out in memory. Everything is in one continuous block which means we always know where the next element is. As you can see, the + operators of random access iterators are very useful. We will be using this for the upcoming post about STL algorithms. For a full list of my tutorials / posts, click here. Feel free to comment if you have anything to say, any suggestion or any questions. I always appreciate getting comments. C++ supports dynamic allocation ( new / delete ). It's a way of creating a object whenever you need it. The object will live until you call delete on it. Otherwise it won't be deleted, not even when it goes out of scope. And if you don't delete it, none will, which in turns causes memory leaks. It might also cause undefined behavior ( which means anything can happen ) if, for instance, you delete something and try to use it afterwards. Smart pointer will help you with these issues and make your code cleaner and better. Several share_ptrs can point to the object at a time. Once you have created the smart pointer, you can use it as a regular pointer. So operations like !=, !, !, ->, * etc. This is not true for weak_ptr, but we'll get to that later. We'll now take an in-depth look at the smart pointers, one at the time. This is pretty straight forwards ; template parameter is the type and you supply an allocated ( new'ed ) object. On Windows, newer versions VisualStudio should support this without you having to do anything. Releasing the object means that the unique_ptr stops managing the object. This means you can let a regular pointer "take over" the object the unique_ptr was managing. So when the unique_ptr goes out of scope or is destroyed in any way, the pointer object it was managing wont be affected. You can't set two unique_ptrs to manage the same object, but you can transfer ownership from one unique_ptr to another. And you can swap the managed object of two unique_ptrs. The other operators works just like regular pointers, so I won't discuss them here. When it comes to unique_ptr, the difference between using make_unique and the regular constructor is slight ( that doesn't mean you shouldn't use make_unique as often as you can! ) But in a shared_ptr things are different. The destructor for shared_ptr is also a bit different from unique_ptr because an unique_ptr will always be the sole manager of an object ( not other unique_ptr or shared_ptrswill be managing it. ) This means it's always safe to delete, so that's what the unique_ptr will do. 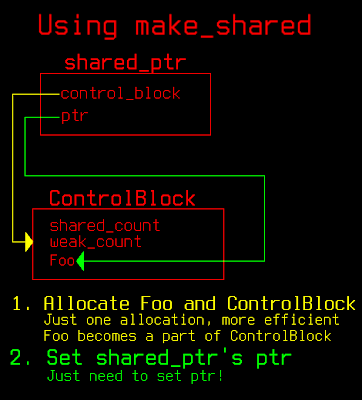 But when it comes to shared_ptrs, we can't do that before we make sure that no other shared_ptrs are managing it. So what we do is that we look on the control block and how many shared_ptrs are managing it. If this is 0, we are the last owner and we can safetely delete it. The weak_ptr reference count it not checked at this point. I'll get into why in the next section that discusses weak_ptr and how the relate to shared_ptrs. Similar to unique_ptrs but here we need to do some extra work. There's two different cases for this ; setting the shared_ptr to be the same as another shared_ptr and setting the shared_ptr to manage a new pointer. As you can see from the examples, you use opeator= for reassigning to another shared_ptr but reset() for reassigning to a different raw pointer. You can't use them the other way around. This can help prevent bugs by giving an error if the programmer uses the wrong versions. The other operators, just like with unique_ptr, works just like regular pointers, so I won't discuss them here. As mentioned in the introduction, weak_ptr doesn't actually manage a pointer. It just holds a non-owning ( "weak" ) reference to an object that is managed by a shared_ptr. It also keeps a pointer to the control block ( the exact same as the one in the shared_ptr who manages the object. 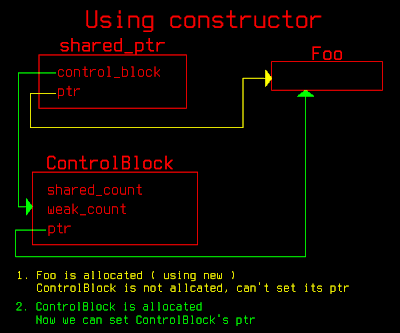 This means it has to be created from a shared_ptr so that it can get a pointer to the control block. 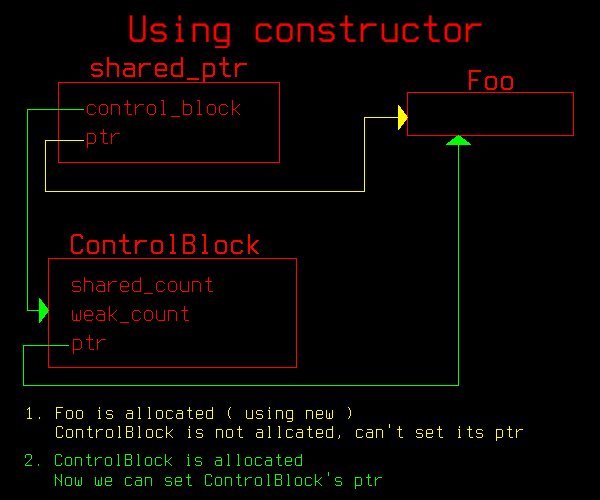 The control block, as we saw in the previous section, keeps a count of both shared_ptr and weak_ptr who's using the object. We also saw that the object will get deleted if the count of shared_ptrs using the object is 0 regardless of how what the weak_ptrs count is. This is part of the point of weak_ptr; it is not supposed to keep objects alive except for in situations we explicitly tell it to. Creating a weak_ptr from a raw pointer won't work simply because it isn't designed to be managing a pointer by itself. And you can't use them with unique_ptrs because unique_ptrs are supposed to be the sole owner. If the object has been deleted, it will still return a shared_ptr. But this shared_ptr doesn't point to anything, it's essentially a nullptr. It will return false if you use it in a if or loop condition, just like a regular shared_ptr or unique_ptr that doesn't manage an object. The shared_ptr returns false and it doesn't enter the if. A weak_ptr can't release the object because it doesn't have control over it, and the object might be NULL. For this reason, weak_ptr does not have a release() function. The closest thing is the reset() function described above. Since we are not managing the object, we don't need to worry about deleting it. You can create reassign a weak_ptr to both a shared_ptr and another weak_ptr. For a full list of my tutorials / posts, click here. Feel free to comment if you have anything to say, spot any errors or have any suggestion or questions. I always appreciate getting comments. In the last post we looked at how to render text. Now let's take this a step further and change the appearance of the font. There are two ways you can change how the font looks. Font style and font outline. You can combine these in any way you like. We'll start of with just setting a single font style at a time, and then move on to see how we can apply several of them at once. As you can see, the style parameter is an int and not an enum. I'll get back to why that is later, but for now let's look at the possible values for style, these are all self-explanatory so I won't be adding a description. Any text you render after setting this font style will have the new effect, but it won't change any text you have written with a different style. So when you set the style to TTF_STYLE_BOLD, all text you render from that point and until you set a different style will be bold. And as long as you pass any of the above values to the function, the font will only have the one last style you set. In order to learn about how to combine these flags, we need to look at binary numbers first of all. 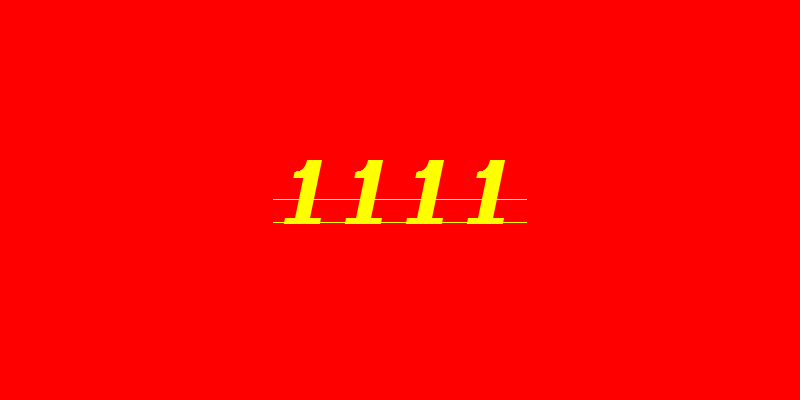 If you don't already know about binary numbers, you should take a look at the above link. It's not crucial, but it is highly recommended to know a little about them. I might create a blog post about them at some point. A computer stores numbers as individual bits ( 0's and 1's ). They correspond to on / off or true / false. Yup, that's right, we can use the individual bits of any number as a boolean variable. As you can see, it has 8 digits. So that's eight different flags. Each of these flags have two different possible values : 0 / 1 or false / true. So that's 8 bools for the price of a single byte! These work on an entire variable. And int, for instance will be false if its value is 0, otherwise its true. But there are similar operations that does this on all bits of a variable. These are called bitwise, simply because they operate on a simple byte. To do a bitwise operation, we need two variables of equal size ( same number of digits ), for instance two bytes. As you can see, the positions where the bits are different is true, the others are false. So now that we know how to do bitwise operations, we need a way of checking and setting the individual bits. This is done simply by using OR, AND and XOR. Before we take a look at how to do this, let's define a few values to check. Here we need to do an AND operation. This is because we have a bit that we want to set to 0. This would work fine if the bit already 0. But if it was 1, then any OR operation with that bit would be true since an OR operation only requires one of the elements to be 1 in order to return true. To check a bit, we need to use the bitwise AND operation. And since we are only checking and not setting, we don't have to store the value anywhere which means we don't have to worry about changing anything. As you can see, we only set the bit that's set in our variable ( TTF_STYLE_ITALIC set ) the others will be 0 no matter what our mask is. The value 0001 is not 0, and thus this evaluates to true and we now know that the font is bold. If our mask didn't have the bold bit set, our mask would be 0010. 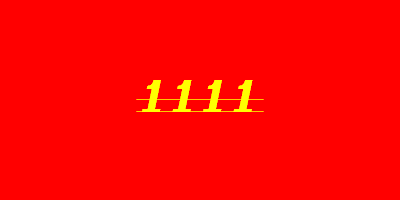 An AND between 0010 AND 0001 is true ( they have no bit set to one in common ) and the result is 0 aka false. Now that we know about binary number and setting, getting and checking the bits, we can put it into use. Below is a simple class that serves as a wrapper for TTF_Font. It enables to set, get and check for flags using enum. I hope this will make it easier to understand and use TTF_Fonts. [ SDL2 - Part 10 ] Text rendering. In the previous parts, we've look at how to render rectangles and images, both with and without transparency. Now it's time to look at how we can render text. Rendering text is tricky. You'll want to be able to render any font, in any size and preferably every possible character. Luckily, with the SDL ttf library, this is easy. SDL2_ttf, just like SDL2_image, is an additional library for SDL2. It can use just about every font, and you can set the size too! TTF, or TrueType Fonts is a type of fonts developed by Apple and Microsoft in the late 90's. True Type Fonts offers a high degree of control on how the font looks. The internals of TTF fonts and how they work isn't important here. The important part is that they're easy to use, will look really nice ( even scaled up. ) And they're also widely used, so finding fonts shouldn't be a problem. As with SDL2_image, SDL2_ttf is a addon for SDL2 that deals with rendering text and makes it very easy. It is based on libfreetype, a library for writing text using TTF fonts. However, it's not very practical to use. SDL2_TTF makes using it a lot easier. But if you do want to use it yourself, you can take a look at their tutorial. Setting up SDL2 requires a tiny bit more work than SDL2_image, but don't be scared, it's still very easy. First we need to install the ttf library. If you can't find SDL2_ttf in any repositories and it's not installed by default, you might have to compile it yourself. For more information, see my blog post about setting up SDL2. Unlike SDL2_image does need to be initialized. Why? Because libfreetype, the library that SDL2_ttf builds upon needs to be initlaized, so naturally SDL_ttf needs to be initalized too. Just like SDL_Init(Uint32 flags) this function returns -1 on error. 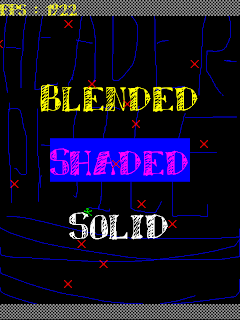 So what's the difference between TTF_RenderText_Solid and TTF_RenderText_Blended? 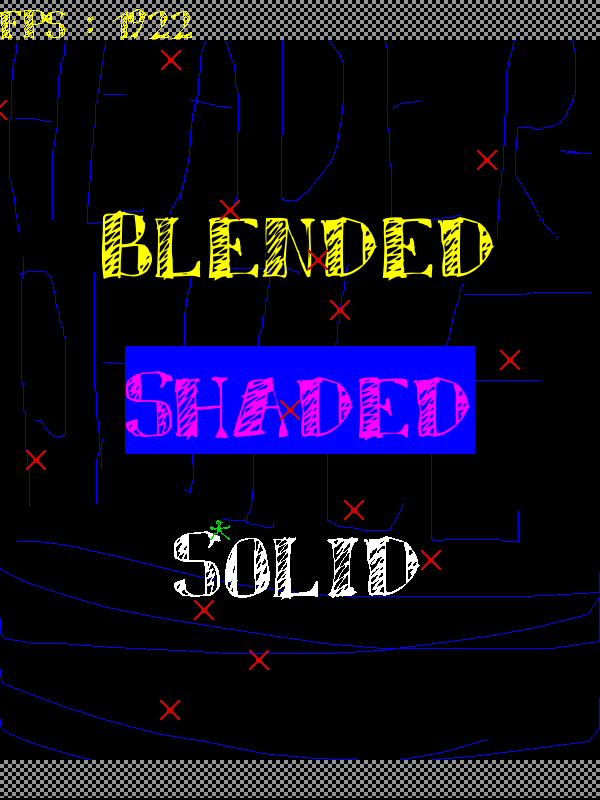 The difference is that TTF_RenderText_Solid is very quick, but TTF_RenderText_Blended produces a better result. In our game, we won't be updating our text surfaces all that often, and there's not a lot of them either, so TTF_RenderText_Blended is a good choice. This function will render the text, but with a specified background color. So it's almost the same as the other two, just with a third argument for the background color. The return value is also the same as the other two. I have done a bit of cleaning up in the game code. I've added a new Texture class for text, cleaned up include, removed ( and added ) comments, improve delta calculation++ Everything should be explained in comments, but, of course, if you have any questions of any kinds, just comment or contact me, I'll be happy to help. For a full list of my tutorials / posts, click here. Feel free to comment if you have anything to say, any suggestion or any questions. I always appreciate getting comments. Below you'll find a list of all the tutorials with a list of part and a short description of each part. A tutorial about making games. Focuses a lot on SDL 2, but also other topics related to game programming. Some parts are pretty extensive so that you'll get a deeper understanding about what's going on. This part gives you a quick introduction to SDL 2. It'll help you set up SDL2 including header files, linking and everything you need to get SDL 2 up and running. It also contains a bare-boned SDL2 program. Part 5 - Collision detection and our first game! Part 6 - Let's load some textures! Part 8 - It's TIME for another update! Part 9 - No more delays! Up until now we've used SDL_Delay to limit framerate to ~16 FPS. We look at how to render using a delta time. This part is very extensive and covers the new timing features of C++11, chrono. It will help you when you're dealing with timing in games and other applications. The chrono library is a new part of C++11. It's used for timing functionality. It supports a variety of different operations and can be quite daunting in the beginning. I wrote a little about it in the previous part of my SDL2 tutorial, but I thought I'd add some more details and try to explain things a bit more throughly here. The library contains several new types, but I'll try to explain all of them shortly. But first a few practical tips that will make using std::chrono easier. using namespace std::chrono: // So we don't have to write std::chrono everywhere! I also want to point out that this guide is rather comprehensive. This is because it's a good idea to have deep understanding how the various components of the chrono library works. Just writing this guide helped me to understand a lot of it. My hope is that it will help you to. If you want more information, you can look at the en.cppreference documentation for chrono. en.cppreference covers most, if not all of the features in C++11 with details information and good examples. It's very useful for learning and as a reference. Both variables are of the type std::intmax_t, which means they are the biggest possible type of signed int available, usually at least 64 bits. A second is 1 /1 of a second. As a part of the ratio header, there's a lot of predefined ratios ( milli, nano, kilo, mega, ... ). Because ratio is not directly a part of the chrono library ( it has other uses than just chrono ), there is no predefined values for minutes, hours, etc. There's just the ones based on the standard units that's used for distance or weight. You can refer to either of these using the std:: prefix. Since the ratios are not part of the chrono library, it's just std:: and not std::chrono::. duration( or std::chrono::duration ) is one of the basic classes of the chrono library. As the name suggests, it stores a time duration or a distance between to points in time if you like. an arithmetic type ( basically any unit that can hold a number ) that stores the number of ticks. a ration containing the type of unit rep stores. In effects this means "how many seconds is one tick." This duration is for 10 seconds. Nice and simple! We do std::ratio< 60, 1 > because a minute is 60 / 1 seconds which is the same as 60 seconds. But there is an even simpler way! Just like in ratio there are predefined values in duration And they're very simple to use. When we're working with two different types of durations things can get a bit weird. A simple example : what's 3 minutes minus 36 seconds. The answer is quite simple for a human to figure out. But the results in your program needs to be a duration but which unit? Since 3:24 can't be expressed exactly in minutes, we need to change either the 3 minutes to seconds, or the 36 seconds to minutes. Here's where duration_cast<> comes in. This is equal to std::seconds. This will fail ( won't compile ) because you loose precision. You could use a duration_cast to fix this, but you'll loose the precision and end up with 0. duration_cast is way of telling the compiler "yeah, I know this will fail loose precision, just do it!" This is not the same as std::seconds because std::second uses int. If you did secondsAsFloat.count() you would get 0.016, because ticks are stored in a double. This will convert the 16 ms to years. If you did yearsAsDouble.count() you would get roughly 5.07356672 × 10^-9 ( 0.00000000507356672 ) years. In order to set the time for a time_point you use clocks. Clocks are just object that has a starting point ( or epoch ) and a tick rate. The starting point is often 1.1.1970 ( UNIX timestamp ) and the tick rate can be 1 second for instance. 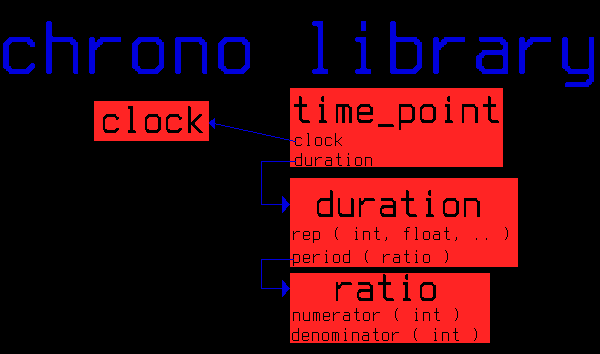 time_point ( or std::chrono::time_point) is the central class of the chrono library. I'll spare the implementation details for now and just say that it contains various information about the current point it in time. Yup, that's a template argument, inside a template argument, inside a template argument! Don't write code like this! If you need a specific time ration, at least put the ration and duration in separate objects ( I've shown you how to use the constructors above. ) Also make sure they're well named like ratio30sec and duration30sec. That should give the reader at least a small hope at knowing what's going on. The function returns the current time as a time_point. As a time_point, you say? Well that means we can just use auto to create one! Only it's even simpler. And we've initialized it to the current point in time at the same time! Time points supports arithmetic operations. This means you can say time_point x - time_point y. This will result in a duration But what is the kind of duration. Seconds? Milliseconds? Years? Actually there is no one answer, it's implementation defined. But the result is almost certain to be less than one second. But we can't control the type of result.